Imagine, 75th Annual Convention and Design Expo. 6-8 November 2014. Houston, Texas. Link to invitation. 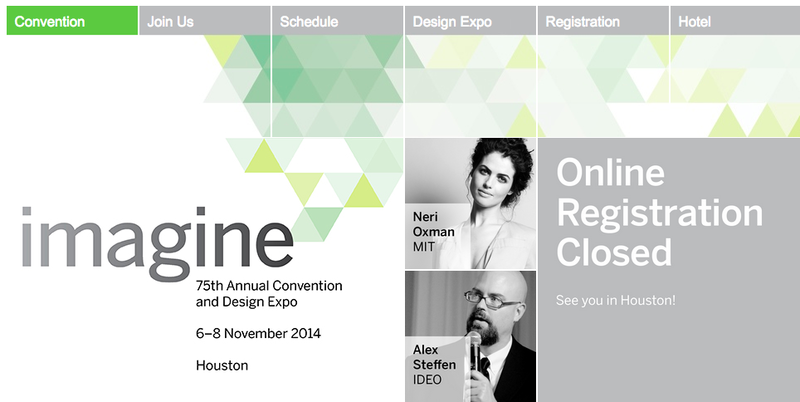 From the website: The Texas Society of Architects’ 75th Annual Convention and Design Expo promises to be our most inspiring convention to date. More than 3,500 architecture and construction industry professionals will gather at the George R. Brown Convention Center in Houston this November to IMAGINE the future of the profession and the built environment, as well as the possibilities for their own contributions to the field and their communities.